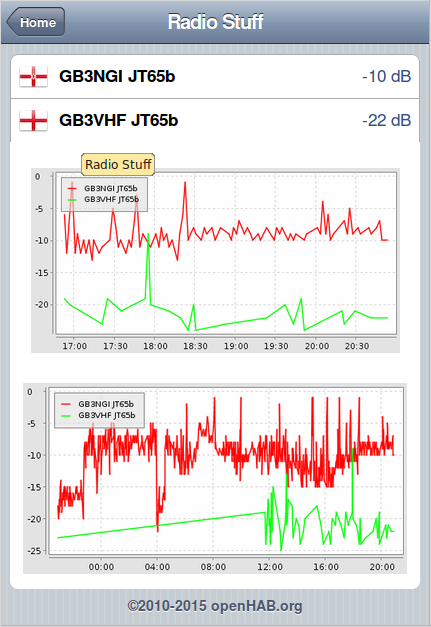 An article about Node-RED by G4WNC in a recent Practical Wireless gave me the push to try and use it in my own radio set-up for alerting and monitoring using a spare Raspberry Pi. The goal is to receive notifications when my own local radio spots new DXCC on HF bands, any WSPR or JT spots on 6m+ and to plot the 2m JT65b beacons I can hear over time amongst other things. Prior to this I was only monitoring the beacons using a script and forwarding this to openHAB over MQTT to display alongside some house statistics. This wasn’t too flexible and openHAB is a bit of a burden on the Pi which would randomly hang. For this project I’m wanting to take inputs from different physical radios & SDR with multiple copies of WSJT-X to display, log certain decodes and alert me in multiple ways if interesting things are seen. Input 1 is set to whatever I’ve left the HF radios monitoring. Inputs 2 and 3 are usually set to monitor the two JT65B enabled 2m beacons I can hear from this location, GB3VHF and GB3NGI, using the same antenna. I have this graphed on openHAB but it’s not working great so will be using something else and graphing from the database instead at some point. WSJT-X can output status messages and decodes over the network to a configured address, this is discussed in a previous blog post where we split the output to AlarmeJT and CQRLOG. We will add a third listener on an extra port, py_wsjtx. Py_wsjtx is a Python network listener that takes the network output from WSJT-X and displays it in a console, either line by line or a curses interface. I have all of the WSJT-X instances sending their data to a single py_wsjtx instance. As can be seen above, this is really handy for monitoring things from a console rather than the GUI and will highlight new DXCC spots and CQ calls. It can also output the decoded messages to an MQTT broker if configure which comes in really useful for what we’re doing here. Node-RED allows us to easily take these MQTT inputs, process them in whatever way we want and act upon them. The image below shows the current set-up. The purple boxes are MQTT inputs and outputs, each of these points to an MQTT broker (running on the same Raspberry Pi) and listens or sends messages for a particular topic. Py_wsjtx sends MQTT messages in the format py_wsjtx/WSJT-X radioname/messagetype which makes it easy for us to configure Node-RED to process them in the correct manner for instance filtering by radio or by decode type. 1. All decodes go to openHAB which is graphing things at the moment, this is shown in the image below and I have it copied to my qrz.com page, I’ll be changing this shortly to something more reliable/configurable. 2. All decodes are logged to a MySQL database which I will use for generating graphs when we stop using openHAB. 3. If the decodes are above set levels, <5 for GB3NGI and <20 for GB3VHF, then send a post to twitter and to me on a local IRC server. Next we have DXCC alerts from WSJT-X, if it spots a new country then a message is sent to twitter and IRC with the spot, hopefully I will see it and respond. To make it more interesting I had it ring the shack doorbell, I’ve got two ways to do this, using a HackRF to replay the wireless doorbell, which is a bit of a waste of an expensive SDR, or ringing via a second remote unit using the Pi GPIO pins. The ringer got annoying quickly so it’s now turned off, flashing a light may be better! Next up we have an input for any WSPR spots on any radio. I’m not doing much with this at the moment other than alerting me on local IRC/twitter if there are any spots on 6m/4m/2m, I don’t often have WSPR listeners on these band though but if I think conditions are looking likely I will switch one of the WSJT-X instances to it. The solar inverter statistics are sent out on 433.9mhz and I use an RTL SDR dongle to receive them and decode with the program rtl_433. These are then rate limited and forwarded to openHAB as well as being written to the database. The other MQTT inputs are DHT11 temperature and humidity sensors in the house hooked up to various Pi I have. I’ve not got around to doing anything with these in Node-RED yet but they are currently used by openHAB. 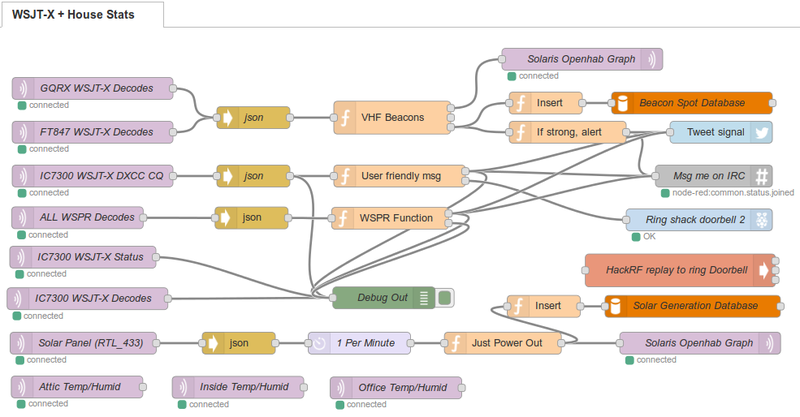 Not much more to say other than it works well for me and I plan on playing about with the flow some more to add some more alerting rules and cutting openHAB out of the solution entirely by graphing the outputs from the database in a more accessible way.